Sonic the Hedgehog 7 is the seventh issue of the Sonic the Hedgehog comic series. It was released in February 1994. This comic features two stories: Uncle Chuck's Treasure, and Sorceress In Distress. It also features three featurettes: The Shadow Nose, Details are Sketchy, and Princess Cruises. Tails is showing off a brand-new see-saw he made to Sonic and Sally, the first time Sonic has seen one since fun and games were outlawed by Robotnik. Rotor Walrus runs in, excited to see the see-saw, and jumps on it. His weight catapults Tails off the see-saw into the air, wedging his head into the ceiling of Knothole Village. He falls out of the ceiling as Rotor calls out that he will catch him. Sonic, with his speed, saves Tails, but a parchment paper falls after him, hitting Rotor in the head. He opens the parchment, revealing a map leading to Uncle Chuck's secret treasure. The other Freedom Fighters aren't optimistic though, as Robotnik has made money worthless. Sonic, rather, is optimistic, stating that Uncle Chuck was a great inventor, thus the treasure may help them fight Robotnik. With Sonic's words of encouragement, Sally, Rotor, Tails and Sonic head to the Mobius National Park: the location of the buried treasure. Sally stops, thinking of what could happen if Robotnik finds them, but Sonic insists on continuing to take the risk. They arrive at the National Park...only to find that it has been turned into a raw sewage and toxic waste dump by Robotnik. Despite the pollutants, the Freedom Fighters continue on, being watched by two Swatbots who overhear them talking about the treasure. The Freedom Fighters continue walking through the dump, following the directions of the map. They stop when Sally starts succumbing to the chemicals, so Sonic takes over with his super speed. He finds the location of the treasure at an X already marked in the ground. Tails, meanwhile, finds a flower that is still alive. Suddenly, a laser blast is fired at Tails and misses, hitting the flower. Robotnik has arrived with some badniks and plans to take the treasure. All the Freedom Fighters get together and run from Robotnik, but Sally recommends separating to split off Robotnik's forces. They do so as Robotnik orders his badniks to chase them. Sonic hides in a rotted tree trunk, as Robotnik declares that they cannot win as they will succumb to the chemicals in the park. Sonic runs out of the trunk, in an attempt to make a plan to use the wasteland to his advantage. Elsewhere, Tails is being chased by a Burrobot. Before it can hit Tails, Sonic grabs its attention. It runs at Sonic, only to have him move aside, ramming into a can of corrosive acid, destroying its drill. Sonic then runs off to help Rotor, who has been grabbed by two Swatbots to be sent for roboticization. He hides behind a pile of garbage and shouts to the Swatbots, imitating Robotnik, to put him down and march to the right. The imitation works and the Swatbots do as he says, walking right into a puddle of sticky ooze. Lastly, Sonic runs over to help Sally, who's being threatened by a Buzzbomber. Sonic grabs her, but she can't run on account of the chemicals affecting her. Sonic develops a plan and badmouths the Buzzbomber. As it flies toward the two, they slide off a slope with a slick of oil, causing the Buzzbomber to hit a rock wall and explode. The two run off to find the others and get the treasure. Later, the group unearths Uncle Chuck's treasure, located in a large treasure chest. Sally mentions that Sonic earned the treasure, as defeating the badniks was a great feat. This causes Sonic to remember something, when Robotnik grabs the chest with a net on his eggmobile. As Robotnik escapes, Sonic doesn't try to chase him, as he remembered what the treasure was when Sally mentioned 'feat'. Sonic mentions they should head back to Knothole as they shouldn't be around when Robotnik opens the treasure. The others are baffled as to what's going on. Back at Robotropolis, Robotnik opens the treasure infront of his badniks...revealing Sonic's bronzed baby shoes. Sonic is preparing to box with somebody...his own shadow. He hits it with some left jabs, some body blows, a left-right combination, a hook to the body, and, lastly, a knockout uppercut. Being able to move faster than the speed of light, he can take shadow boxing to a whole new level, with his own shadow knocked out on the floor. Somebody is making a drawing while somebody else narrates it. He starts with a round head, followed by a black nose. The drawer draws it too big but corrects it. The drawer starts drawing round ears, but the narrator corrects him, as they are supposed to be pointy. He then starts on the eyes, but draws them too beady. He finishes up, as a damaged Crabmeat confirms the suspect of his injuries to the drawer, Robotnik, as Sonic the Hedgehog. It is the annual fright night party in Knothole, and everybody is dressed up. Rotor is dressed as a bad report card, Tails is a two-tailed skunk, Sally is a sorceress, Sonic is a bush of poison ivy, and Antoine is a devil. Sally's costume is incomplete, as she doesn't have a stick to use as a magic staff. Antoine volunteers to accompany Sally into the forest to find a stick. Sally, however, is tired of having bodyguards such as Antoine and Sonic, and storms off into the forest alone, ordering Sonic and Antoine to say behind. In the forest, she finds a stick that looks like a real sorceress staff, so she picks it up. Unknown to her, nearby, a water geyser is ready to erupt from beneath a rock. She points the staff at that rock and orders it to rise, just as the geyser erupts, launching the rock high into the air. Not realizing about the geyser, she thinks her staff is actually magical. Meanwhile, using Forest Viewer in Robotropolis, Robotnik watches as Sally lifts the rock with her magic, not realizing she is Sally and instantly falls in love, thinking she can help him take over the universe. Sally tries her stick on a log, unable to get it to rise. She sits down on it, realizing that the stick may not be magical afterall, or that she was not saying the right words. In the middle of her thinking, Robotnik jumps out of a bush infront of Sally with a bouquet of living-being eating weeds, a box of bot-bons (chocolate covered oil candies) and lastly, a love poem. He then proposes to Sally, leaving her absolutely confused. She then realizes that Robotnik doesn't recognize her and decides to continue the ruse to prevent roboticization. She asks him if she can have time to think about it, which Robotnik gladly accepts and takes her to Robotropolis to prepare the wedding arrangements. Sonic watches all this go down behind a bush, but is reluctant to help Sally as she would then know he followed her despite her orders. He decides to follow them. In Robotropolis, Robotnik announces, in a large auditorium, to all his badniks, that he doesn't allow celebration, but has decided he will allow 10 seconds of celebration as soon as he is married to Sally by the wed-o-matic, a machine that spouts marital vows and lines. Sonic watches from the other side of the stage curtain, thinking of a way to help Sally without her knowing he helped. Before the marriage, Robotnik asks Sally to provide a demonstration of her magical powers, to ensure she is not tricking him. Sally reacts in fear, knowing she will be caught. Sonic enters into a warp speed spin, to become invisible as Robotnik waits for a worried Sally to start. While waiting, an invisible spinning Sonic starts hitting Robotnik, stubbing his toe, and flipping his cape over his head. He then throws Robotnik into the crowd, all the while with Sally watching in confusion. Robotnik has a change of heart and orders his troops to catch her, only to have the invisible Sonic carry Sally away, thinking she's flying. In the forest, far from trouble, Sally looks down and breaks Sonic's cover, telling him to put her down, knowing that it is him. Sonic stops, apologizing and saying he was just trying to protect her. Sally realizes that and kisses his cheek in appreciation, and breaks her stick over his head for disobeying orders. Antoine is trying to convince Sally to build a large naval fleet for the Freedom Fighters, Sally declines the offer. He tries to entice her more by saying they'll sail the seven seas of Mobius under the Crown of Acorn, which Sally still declines. Antoine continues on, saying that she'll be the inspiration of the future Mobius naval officers. Sally flames up and yells at Antoine, a big 'NO'. She marches off in a huff, leaving Antoine with his little canoe. Uncle Chuck is introduced by discussion. 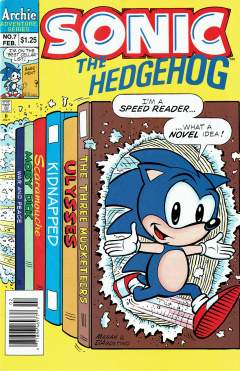 The cover for issue #8, shown in the Sonic-Grams section, is different than the final layout.